Rupesh and Pradip became inspired to develop a career in mortgage broking after submitting a loan application to buy an investment property. 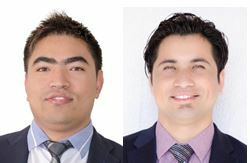 Soon after the application they studied for their Certificate IV in Finance and Mortgage Broking and Finance followed by Diploma in Finance and Mortgage Broking Management; both of which they studied with passion. Mr. Rupesh has a Bachelor of Business Administration with in depth knowledge of market and other stakeholders. Mr. Pradip has long term business experience in Subway and a service station; both have a strong sense of customer service and excellent communication skills. Pradip and Rupesh focusing purely on people’s needs; finding mortgage solutions that meet their financial and personal goals. Whether you are looking for a simple solution for your unique needs, or just an aggressive rate, they can offer you various options. For customers, roaming around for the right mortgage can be a complicated and time consuming process. Pradip Shrestha is a Credit Representative (Credit Representative Number 486215) of BLSSA Pty Ltd (Australian Credit Licence Number 391237). Rupesh Thapa is a Credit Representative (Credit Representative Number 486207) of BLSSA Pty Ltd (Australian Credit Licence Number 391237).